Unusually high levels of smog are raising alarm across Asia, with authorities in Bangkok finding ways to stop it. A combination of construction dust, auto exhaust and other pollutants, over Bangkok due to prevailing weather patterns, has taken air quality to unhealthy levels in recent days. 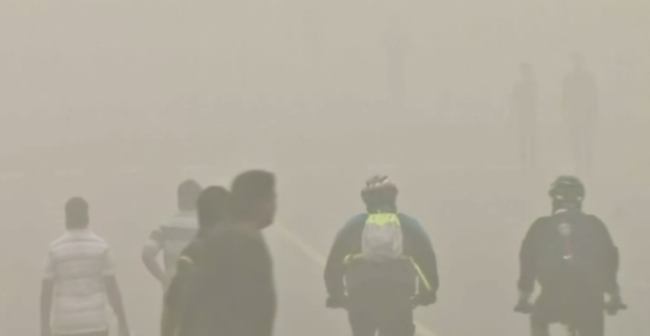 The city was handing out some 10,000 face masks, spraying water to help settle dust and tightening controls on when big trucks can use city street. The Thai Pollution Control Department said that about half of the high levels of PM 2.5, tiny particulate matter that can dangerously harm lungs, was due to the diesel engine emissions. “I admit these are temporary solutions but we have to do it. Other long term measures will also be carried out,” Police Gen. Aswin Kwanmuang told a meeting of army, police, pollution control and other officials on Monday. 1. What is the direct cause of the heavy smog in Bangkok? C The prevailing weather patterns. D The other pollutants in the air. A Bangkok’s authorities have taken some measures to cope with the problem. B Providing face masks and spraying water were both long term measures. C Half of the high levels of PM 2.5 was caused by diesel engine emissions. D Thailand’s air pollution problem is related with the seasons in some way. 3. What can we infer from Oranart Phongpreecha’s words? A The heavy air pollution was completely caused by factories. B She often gets sick when she is out. C The polluted air has done great harm to her lungs. D Air pollution has affected people’s life and health. 4. What’s the real purpose of the author writing this passage? A To rise people’s attention to the environmental problems. B To show how Thailand copes with the severe smog. C To highlight the growing environmental pollution problem in Bangkok. D To illustrate the cooperation of the public in solving the air pollution problem.